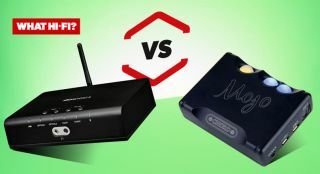 Arcam irDAC-II vs Chord Mojo - which is better? | What Hi-Fi? Arcam irDAC-II vs Chord Mojo - which is better? How does Arcam's latest desktop DAC stack up against our current Chord class-leader? Thanks to the exponential rise in the popularity of digital music, a digital-to-analogue converter (or DAC, if you will) has become the crux of a system. Its life’s purpose: to convert your digital files into analogue waveform so they can be transmitted through your headphones or speakers. They are everywhere – built into smartphones, tablets and computers – but not all are born equal. The better the DAC, the better the sound quality - and this quest for better performance has seen the dedicated standalone DAC market explode to astronomical levels in the past five or so years. If your budget is as healthy as £500, you might well look to two of the biggest and most decorated DAC purveyors, Arcam and Chord. One of these has appeared in almost every Awards issue since the DAC category was first included in 2008. Here, the £400 Chord Mojo (short for ‘Mobile Joy’) – the brand’s entry-level DAC and our current Award-winner – battles it out against the £495 successor to Arcam’s multi-Award-winning irDAC, the imaginatively named irDAC-II. Game on. Both products are very much built on the rich DAC heritage of their brands. Instead of using the off-the-shelf DAC chips inside its converters, Chord uses programmable processors loaded with proprietary software. Meanwhile, the Mojo uses the latest and most powerful processors, making it, on paper, the company’s most capable model. Compared to its Award-winning predecessor, the irDAC-II boasts new internal circuitry, a new headphone amplifier stage, and the adoption of an ES9016 Sabre DAC. The headphone output stage has been taken from the brand’s flagship A49 amplifier too, so there’s no shortage of impressive tech under its hood. The Mojo may pip the irDAC-II with an upper sampling-rate limit of 768kHz, but when the vast majority of music available is 192kHz or below, it’s hardly a benefit over the Arcam’s 384kHz. Both handle the DSD format too, and share a number of common connections: USB (the Mojo micro, the Arcam type-B), coaxial and optical inputs. Arcam makes use of its room around back by doubling up on the latter two. It’s worth noting, too, that the Mojo’s coaxial takes the form of a 3.5mm jack rather than the usual RCA or BNC. There are 3.5mm headphone jack outputs on the facades – the Mojo sports two. Arcam also has fixed and variable analogue RCA sockets so you can choose to hand over volume controls to another component in your system, and one-ups the Mojo again with Bluetooth connectivity. Want something versatile that will fit into almost any system? The Arcam is surely that. But the Mojo strikes back with portability – and we aren’t just talking size. While the irDAC-II runs off mains power, the Mojo gets you around eight hours of use from a full charge, which is facilitated via a second micro-USB port. Design-wise, these are two very different beasts. The palm-sized Chord, ideal for sharing a jacket pocket with your smartphone, is dwarfed by the Arcam’s traditional box-like chassis, which is a little larger than its predecessor, yet still desktop-friendly. If you have room for a book, you have room for the Arcam. Ultimately both are well made, their aluminum casings solid and neatly finished. The Mojo’s diminutive size means controls are limited to three roller buttons for power and volume. These light up in different colours to indicate volume level and the sample rate of the input signal (red for 44.1kHz, green for 96kHz, white for DSD). You get the hang of it after a while. We wish the Arcam could display sampling rate information, although on the plus side controls are more immediately accessible with their well-labelled buttons, of which there is one for almost every operation. There’s a remote control handset too, so if you’re using the DAC within your hi-fi system you don’t have to leave the sofa to change volume or input. Until now the Mojo and irDAC-II have been neck and neck as they head towards the finishing line. The former makes headway for portability, the latter strikes back with greater connectivity – but it’s performance where the Mojo manages to pull the Arcam into the mud pit. It offers a level of insight that simply isn’t superseded until, in our experience, you get to Chord’s £1800 Hugo 2 – which says a lot for a product at less than a third of its price. It’s not just the amount of detail it offers, but how it’s all so effortlessly arranged into a cohesive and musical whole, so naturally rhythmical and dynamically surefooted in its step. While the Arcam serves up a bigger sound, and impresses with its vast scale and refined, weighty and spacious performance, it doesn’t quite have the same rhythmic aptitude and precise timing. And that is what loses Arcam the round. There’s more energy to lap up from the Mojo too, and ultimately that and a combination of greater dynamic expression has us reaching for it over the Arcam, whether we’re listening to Robert Schumannn or Iggy Pop. There’s no escaping the fact: musically, the Chord Mojo is in a league of its own. It’s that level of competence, and at an entry-level price too, which simply blows away the competition. The irDAC-II might be the latest entrant in one of the most successful DAC lines we’ve come across, but on this occasion, it will have to settle for second place.